Tom Nugent, one of modern football’s greatest innovators, was the coach who moved Florida State football firmly into the major college ranks. In his 17 years of college coaching, six at Florida State, Nugent developed the “I Formation,” now used by a majority of pro and college teams. He also invented the “Power I.” Arriving at FSU in 1953, Tom Nugent was 34-28-1, but he is credited with catapulting the Seminole program into the top tier of programs leading the program as it moved from small college opponents to the likes of Georgia, Miami, Georgia Tech, Auburn and Tennessee. 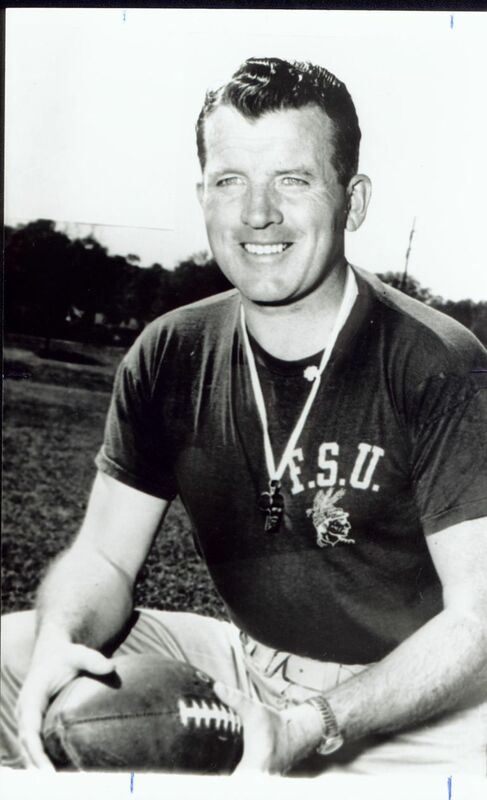 The most significant schedule change in the Nugent era was FSU’s first battle with Florida in 1958. Nugent, who also served FSU as athletics director, brought color and visibility to Florida State football, which took a giant step forward under his able guidance.